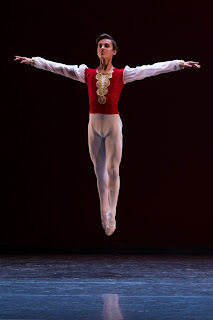 in La Ballarina de Picasso by Remi Wortmeyer for Ballet de Catalunya. The pace is hectic these days at the Cultural Center of Terrassa, home of the « Ballet de Catalunya » (BNC). 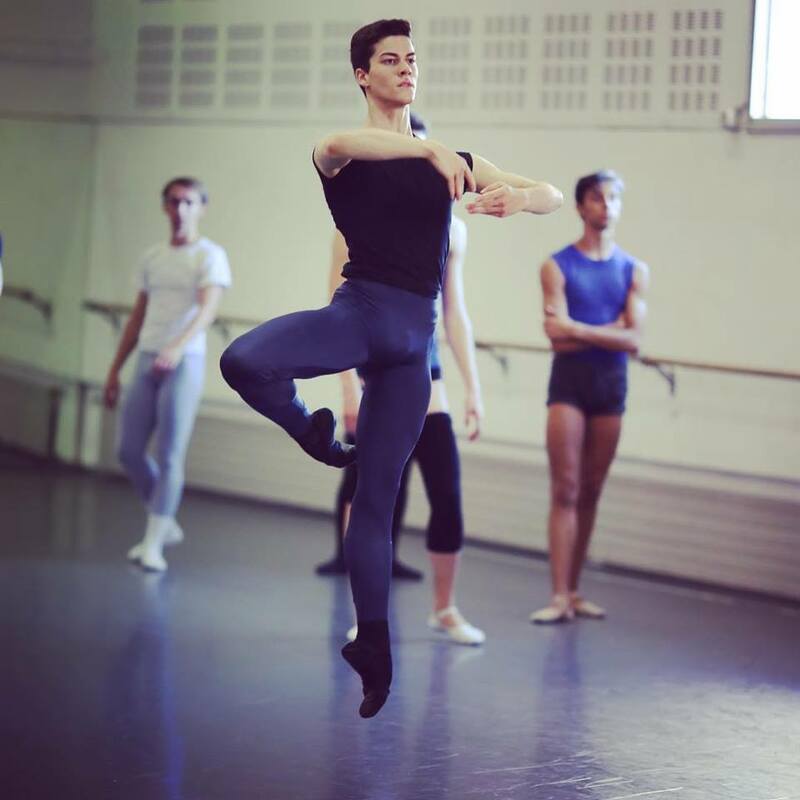 Remi Wortmeyer, Australian choreographer and dancer, currently Principal at the HET National Ballet, has been living in Barcelona for over two months working with this young cast in what will be his first long length ballet, "La Bailarina de Picasso". «La Ballarina de Picasso» bases her story on Olga, a ballerina of the Ballets Russes and who was Pablo Ruiz-Picasso's first wife, and unique, since she never divorced him. Olga Kokhlova meant a before and after in the life of Picasso, both on a personal and artistic level, she captivated him, inspired him, motivated him, overwhelmed him, despaired him.... Also this new creation, we will not doubt, will be a milestone and a turning point for the Ballet de Catalunya, a company that is consolidating, is becoming known and already has a large audience that continues to be enthusiastic. Lorenzo Misuri and Rebecca Storani. We had a chat with the main authors of this exciting adventure, who told us in first person about their personal experiences, giving their point of view about this production. Elías García, Artistic Director of the « Ballet de Catalunya », explains how the idea of ​​a new creation and complete ballet to be part of the 36th Dance Season of the Cultural Center of Terrassa, was born : «As it is well known, Ballet de Catalunya, started a year and five months ago. Starting a company from scratch is a difficult task, (finding dancers, venues, theater, etc). Despite this short journey, we are focusing our work to produce to the maximum in order to offer a product and above all to find the identity that the Company needs. So far, in these months, the Ballet de Catalunya has produced five programs, two of them complete ballets (Don Quixote and The Nutcracker). With Leo Sorribes, General Director, we decided to raise the bar and bet on a new production of full Ballet, but this time something that was created and designed for the Ballet de Catalunya and from here the idea arose. Regarding why Remi Wortmeyer, Elías continues: «Remi Wortmeyer is a young choreographer and a dancer with a very great career, currently a Principal Dancer at the Het National. 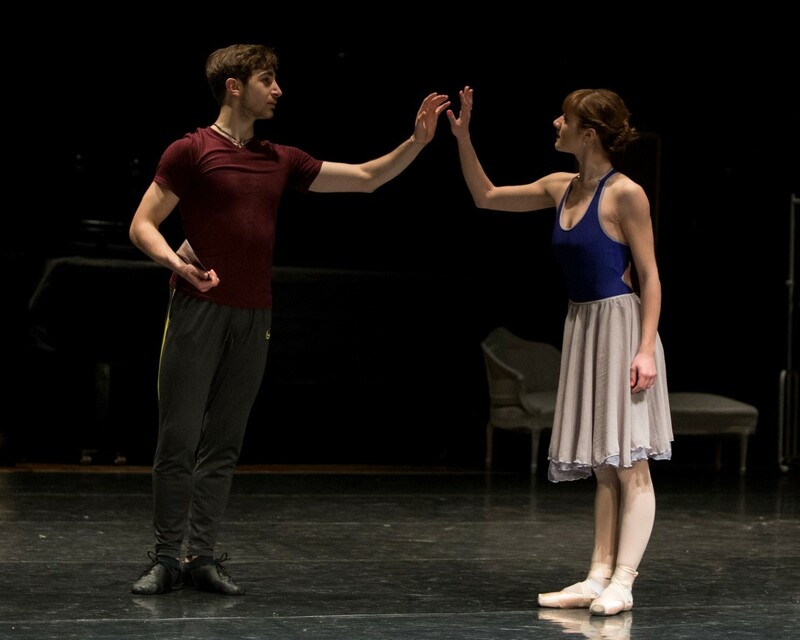 In the second program presented by Ballet de Catalunya, Tripple Bill, one of the choreographies was signed by Remi, Concierto Mondrian, a choreography who has been a great success. Remi uses a very Nordic-European vocabulary, which attracts me a lot. As an artistic director, I seek in all productions to approach, even with small brush strokes, what is the territory, because I believe that our culture can give the identity that the Company needs, in order to differentiate itself from others. Remi proposed this wonderful story, Olga, Picasso's first wife and mother of his first child. The story intrigued me a lot and when we discovered it, we decided to bet on it and I was convinced by the fact that the protagonist was a genius who comes from our territory». Lise-Marie Vervoort and Remi Wortmeyer. As for when the company is now at an artistic level, Elías explains to us "The company is growing exponentially and I am beginning to see a cohesion between the dancers. Do not forget the young age of the cast. At a technical level, the dancers, thanks to the teachers who assiduously work in the Ballet de Catalunya, Angeles Lacalle and Vincent Gros and when time permits, mine, is reaching a high level and thanks to the productions made so far, at the artistic aspect the company is positioning itself at a good point, without losing sight of all the work that we still have to develop. With the Nutcracker and thanks to the Cultural Center of Terrassa where the company has its headquarters, we made a work of awareness to the younger public and I hope that with the new program, La Ballarina de Picasso, we can continue with this important work, reaching the maximum of public of all ages. Hoping that this program will help the Ballet de Catalunya to move forward. We also had the opportunity to share a very nice evening with Remi Wortmeyer who gave us his vision. Installed for a long time in Barcelona, ​​a city that he confesses to adore, he must absent himself from time to time to attend some premieres of his ballets. He has a lot of work, right now he has six commissions for new ballets, one of them for the next season of the HET National Ballet, with whom he continues to dance as principal in Amsterdam, but now he is completely immersed in this new adventure, with which he is delighted. "It was immediately after the premiere of Mondrian Concerto which I created for the Ballet de Catalunya last season that I was asked to create a complete ballet to premiere next year. They asked me to make the argument fit the culture of the country, something that I totally agreed with. So I undertook a search process and found the perfect story in Olga's life». "The story is based on the Russian dancer who conquered Picasso. Once the character was found, everything flowed naturally, the dancer, Olga, the Ballets Russes, the Spanish painter, Picasso, all confirmed to be the perfect script for a ballet, for a company from the country of the genius and for this young company. About sets and the costumes, Remi told us : «Yes, I made the designs of everything, I like to control all the production, and I always had a clear idea of ​​what I wanted. The budget is tight and we have had to move to get the necessary elements in the desired quality, or as close as possible to it for fabrics, reproductions, etc ... I must thank the enormous help that Marina Quera (Executive Director of Ballet de Catalunya) has given me in this sense. Regarding the cast, Remi explains «I found the company with some changes, which is normal, but in general they form a very powerful cast and it has progressed a lot since I was last with them. I am very happy to see these young artists grow in the way they do. Obviously for them to participate in the creation of a ballet -in this case with me, but it could have been with any other creator- it is very rewarding and they live it with great enthusiasm and intensity. I came with a clear idea of ​​everything, steps, style and interpretation of each character, etc ... Although something has changed in the meantime, basically I continue with my initial scheme. I teach the dancers exactly what I want and I try to stimulate them to give the maximum of themselves, but if at some point you have to make some small concession so that they feel more comfortable or to improve the fuidity of the dance, I am willing to consider it. But I must say that they have done a great job and I am very satisfied with all of them!" Rebecca Storani (Olga): «Remi, besides being a choreographer, is a very complete artist and this shows a lot in his work with us. His care in the details and the way to express an emotion with his body, is incredible. I think this is what I will more keep on me of him and of these creations that we are doing. His way of working is also ideal for me, you have to always be very attentive to every little movement he makes, but at the same time make it yours, personal. He, as I said before, takes great care of the details and the little things, but at the same time leaves you room to see how you can make yours a movement without changing the story. Surely I have an opportunity that not everyone can have in life, that a choreographer so important and with so much experience is making a creation on you. It is a luxury and an honor for me, especially because I have such a beautiful role, but at the same time very difficult. I am very happy to have been chosen by him for this wonderful creation that is Olga, the wife of Picasso. I must admit that it has been a very difficult process, but at the same time a great one. To internalize the character, I started watching documentaries of Picasso's life, to know his whole life well and to know to what extent he abandoned himself to the love of his inspirational muse and future woman, Olga. After, I read some books, I have even seen one in Russian, that although I have not understood anything, but it has helped me a lot because of its photographs of Olga, of them two together or even designs that he made, to see her poses, her movements, trying to look as much as possible like her, and trying to make her own movements but a little more stylized than in that era she lived. Olga is a difficult role, with personality changes throughout the ballet. It begins as a happy woman doing what she likes (dancing) and a pure woman, who knows Picasso and falls in love with him. Little by little, during the show we will see Picasso flirting with other women and it is here that Olga will start to faint in her strong and pure character at the same time. When you realize that the person you love most is not the same he was at the beginning, that he will not always be by your side to help you, this hurts... and this goes through until he meets Marie-Thérèse, his future lover and from there it begins for Olga an internal struggle with herself, not to believe that it is true, until her total abandonment to madness for love. There is still a lot of work to be done, but I am already very happy for the comments that I have been told: "you have found Olga". When I dance, I already feel everything as if it was real, I try to imagine the whole story of truth and I feel the pain in my chest, as if this really hurt me ». 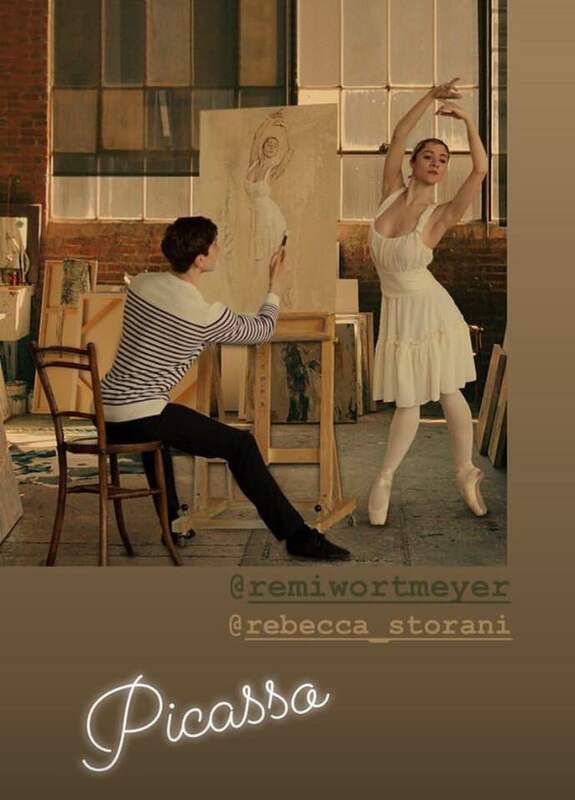 Lorenzo Misuri (Picasso): «Every time I am struck by Remi's work, his quality of movement is fluid but at the same time dynamic and precise, for me this is the "style of Remi" and it is an element that I have also found in his choreography created last year for the Ballet de Catalunya (Concerto Mondrian) and in Picasso's Ballerina this year. Moreover, another important aspect that I want to highlight is the great talent that Remi has in explaining and transmitting to us dancers in a clean, precise and clear way, the idea that he has of his choreography in all aspects. Remi is a Principal dancer with excellent musicality and a beautiful movement, and succeeds in bringing these two important qualities also in his choreographic works ». Thank you very much everyone for your collaboration and for allowing us to get closer and also live a little bit this creative process whose end will be this beautiful ballet. We are certain that at Ballet de Catalunya, everyone involved, but mainly these great artists, will make us dream and will deeply move us with this amazing history of Olga and Picasso. There are very few tickets left, hurry up to get yours !! During our last trip to Sweden, we had the chance to meet Dmitry Zagrebin, principal dancer of the Royal Swedish Ballet. It was a sunny Sunday in Stockholm when reaching the end of the Summer. It was Dmitry day off so we decided to meet in one of these nice coffees in Sodermalm, not far from the SoFo where he lives. Dmitry was born in Moscow and has been involved in the dance world since he was a child. An important reason for that is the fact that his parents and grandparents were professional dancers at Bolshoi Ballet, he studied at the Bolshoi Ballet Academy, where he combined his dance studies with teacher studies of Master of ballet. Dmitry with Rebecca Storani in D.Q. 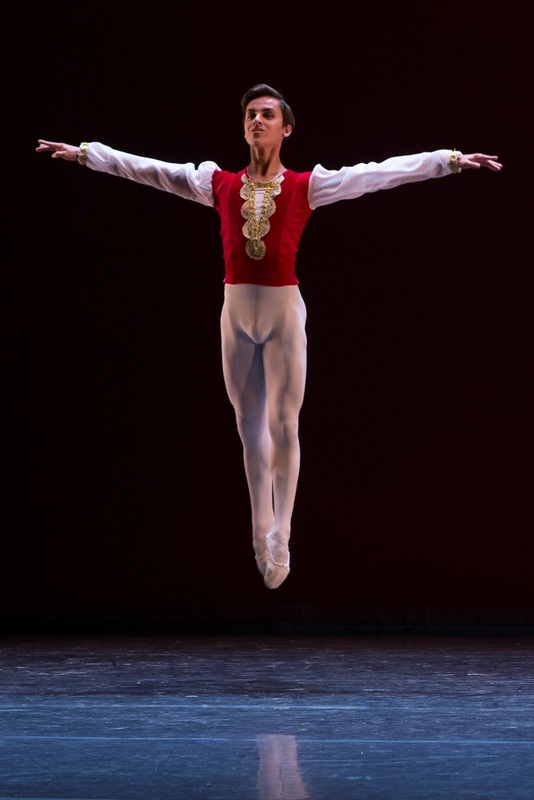 After he graduated, he joined the Bolshoi Ballet at the age of 18 and he had the change to work with Alexei Ratmansky, who was leading the company at that time. 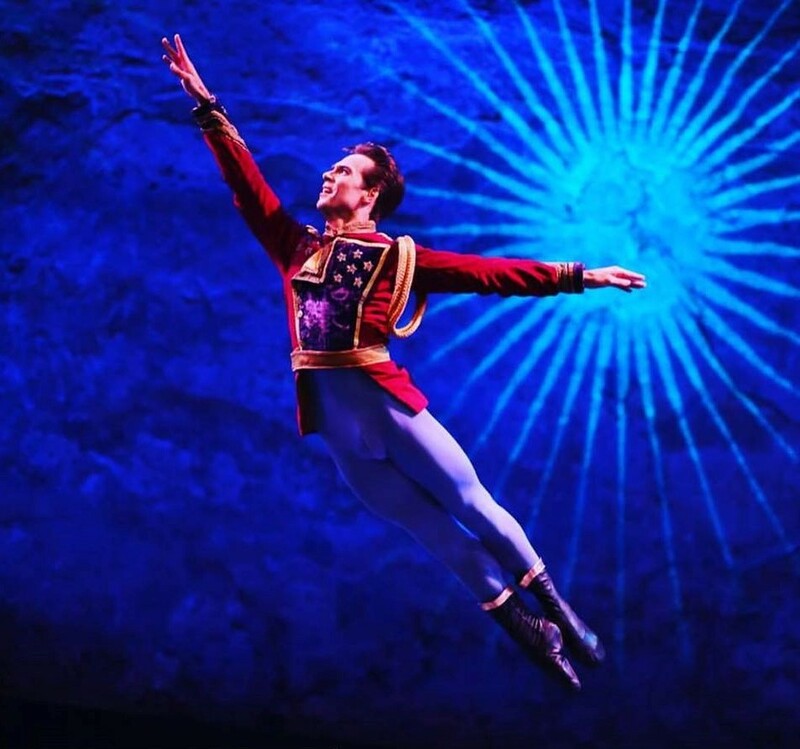 In 2015 he moved to Sweden to join the Royal Swedish Ballet, where he is currently principal dancer. When we met he was performing Marcia Haydee’s Sleeping Beauty in the Kungliga Operan, in the role of Prince Desiree. Sylvia Julià: After your experience in Russia and Sweden, which differences de you see between the two countries regarding how they live the Ballet? Dmitry Zagrevin: Booth theaters are very old so when you get to dance on stage you feel similar atmosphere, that kind of amazing spirit you never get in concert halls. S.J. : Which is your routine as a dancer in Stockholm with the Swedish Ballet? D.Z. : Starting from mid August, the schedule is quite tight, specially this season. From next week we will already start rehearsing a Triple Bill with works from Jiří Kylián, Angelin Preljocaj and Lukáš Timulak, while we are performing Sleeping Beauty, and in few weeks we will start rehearsing the Nutcracker. Two years ago the company used to tour, but not any more, currently all performances take place in Stockholm Opera house, but when I have free time and permission from work I’m always open to go somewhere else to join interesting projects, on my own. Dmitry in Ibstage with D.Q. S.J. : During your life you have won several awards, the last one in 2014 and it was the Gold Medal at International Baltic Ballet Competition in Riga. What these achievements have represented in your professional career? D.Z. : It’s always an opportunity to challenge yourself technically, physically and artistically, but it’s also very good to meet other colleagues from other territories and see how they dance and how they move, to make connections and meet friends. Even if it’s a competitive environment it is in a good way and I mainly do it for fun. S.J. 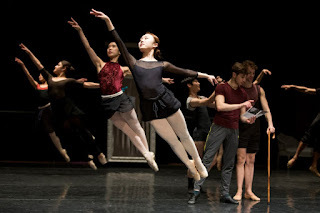 : In your repertory we can find leading roles in very important classical productions but you have also performed Jiri Kylian, Ratmansky and also Bournonville repertory. Which would be your favorite one or the most special one for you? D.Z. : With Bolshoi Ballet I had the chance to dance Mercutio in Yuri Grigorovich version of Romeo & Juliet and it was an amazing experience to participate in this production and to share studio with Yuri Grigorovich. In Moscow I also danced Jiri Kylian’s Symphony of Psalms and Ratmansky’s Russian Season, this last one in my second season with Bolshoi. Most leading roles I performed when I arrived to Sweden : Swan Lake, Nutcracker, Sleeping Beauty, Alice in Wonderland, and I will perform Jiri Kylian Wings of wax in November. Here in Sweden, about a year ago, I also performed one of the leading roles in Bournonville’s Ponte Molle, renovated by Dinna Bjørn and Frank Andersen. That was an amazing experience but also quite challenging because I had to add some steps to the Bournonville’s piece, just because there were no steps in the original scrip. Frank and Dinna gave me instructions about how it should look like, how it should start and where were the important places of the choreography, for example, they told me this movement has to end up in a knee and I had two eights in the middle to fill with my own steps. This was a responsibility and a personal contribution to the Bournonville piece. A very special and super different role I remember it was a small role in Mats Ek’s Juliet and Romeo where I had the chance to dance with Ana Laguna on stage. It was ... I don’t know how to explain it... how honored and how gifted I felt when I’d got to dance on stage with Ana Laguna in this master piece of Mats Ek, it really has a special place in my memory. I’m happy I embraced the opportunity to be involved in Mats Ek production and I would like to work with him again in the future. S.J. : How do you prepare a role? Especially those that have quite a lot of acting. D.Z. : It really depends which role it is, in my opinion quite often acting roles in the classical ballet are over-rated, because you have a limited amount of music and you have a choreography steps that has to be precisely danced, let's say you have two eights in the music to show that "I will go there" or "I love you" or "I'm leaving" and it has to be exactly in the music, every single gesture, and it will be enough, all the audience will recognize it, they will understand the movements. Of course you need to know choreography, to be physically well prepared and you need to know the ballet you are doing, but sometimes when you think too much, when you over-rate your acting, you can lose the focus on the precision of the movements and music. You can take inspiration from other dancers but never copy. In my experience, it won't come up from the first performance, from your premier. I did Sleeping Beauty premier last season and I repeat it now and in main scenes and in certain movements I feel much calmer, I feel that it's much easier for me to do it, it all calm down. S.J. : You are performing Prince Desirée in Marcia Haydee’s version of Sleeping Beauty with the Swedish Ballet, how was your experience working with her? Marcia is very interested in the acting side of the ballet dancers, what do you think? D.Z. : It was an amazing experience to dance with Marcia, I adore her, she is gorgeous. When I was rehearsing Price Desirée she told me "you don't need to do this particular step, you can change it and do it how you feel it, but you have to look beautiful". Regarding the acting part in this ballet, of course in any company many dancers can step in and do 32 fouettés, but to be a true principal dancer it's more than that, so I totally agree with Marcia, but all this technical staff has to be there as well. S.J. : As a dancer, you dedicate most of your time to dancing, training, rehearsing, travelling, ... but what other things you like to do when you have some free time? D.Z. : Movies, reading,... but no physical exercise. You need to be smart to not to hurt yourself and be in shape. You need to work with your brain all the time and learn from experience, and sometimes don't go for everything and maybe don't over-rate your acting on stage (he smiles). S.J. : Where do you see yourself in 10 years? Do you see yourself linked to dance all your life? D.Z. : I have a diploma as a Ballet Master, so I could teach in a company. Taking my mother advice, I divided my time between the work at Bolshoi Theater and my graduation as a teacher at Bolshoi Academy. But now I can't say what I will do in the future, only that I will share my dance as long as I can. When I was 12 I played the role of little Mozart , a leading role in the opera production Bastien und Bastienne from Mozart, where I had to dance and I had to talk. I enjoyed a lot and felt very comfortable, so if I have any kind of opportunity related with acting I will definitely go for it, even movies, no idea, but I could do it. Dmitry and Rebecca in D.Q. for Ibstage Gala at Gran Teatre del Liceu. S.J. : We had the chance to see you dancing with Rebecca Storani in the IBStage Gala in Barcelona some weeks ago and I have to say that it was amazing. How was your experience of dancing with her? D.Z. : It was one of the best partnership experiences in my life, she is a extremely professional ballerina, very good on eye-contact on stage, when you just trust each other, you know. I have danced Don Q. many times in my life and I felt very comfortable dancing with Rebecca, she was very focused and everything went just amazing. I have to say I was shocked in a very good way. We met the same day in the morning and we went on stage after 10 minutes of checking out. She is amazing and I would love to dance with her again. S.J. : We are working to promote ballet in Catalonia and to have artists like you performing there it will help to achieve our goals for sure, so we hope we can see you dancing again in Barcelona or maybe performing with Ballet de Catalunya in Terrassa. D.Z. : You have such a beautiful theater in Barcelona and it would be great to see more ballet performances there. Theater is huge and the atmosphere on stage was amazing. I really wish that ballet art can grow in Barcelona, so if I can give any help I would like to do it. This is the third time that we have Anastasia Limenko at the Ibstage Galas. She tells us that she is delighted to accept their invitations, she loves Barcelona and the atmosphere that is breathed in this course of the highest level that she defines as unique worldwide and a model to follow. Anastasia Limenko in Black Swan. Ibstage Galas. We cross her in the hall of the Institut del Teatre, she is the first of the great stars invited that has arrived to Barcelona and after doing a class and taking a small snack, she tells us that this may be a good time for the interview that we are suggesting. We do not miss the opportunity and chat with the very young Principal Dancer of the Stanivlasky Theater in Moscow. Carolina Masjuan: Anastasia, I think it is the second time you are dancing here? Anastasia Limenko: No, in fact it is my third time! 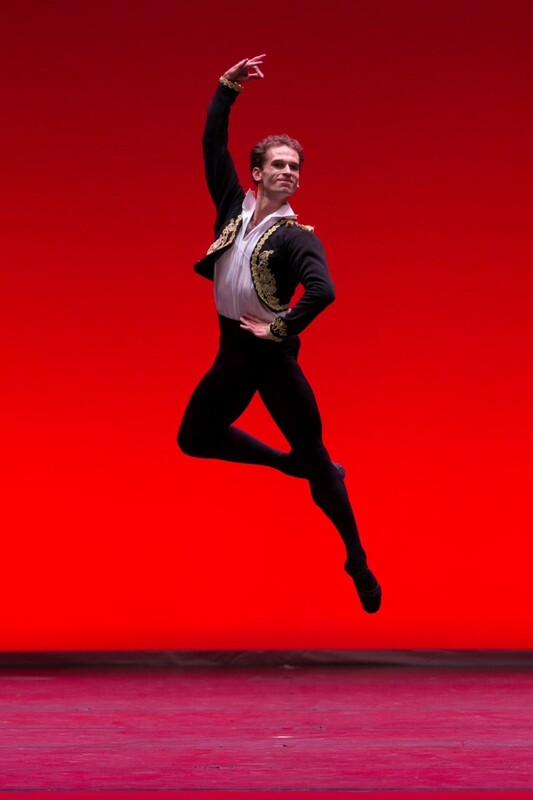 I came twice last year because I came in July when I performed Don Quixote for the Galas at El Liceu and then I came back in September for the Galas at Theatre Grec where I danced with Kimin Kim. So now it is the third time I'm here for Ibstage. C.M. : Oh yes, you are right! and how it happened that we are so lucky to have you here? A.L. : Well in fact it was through Instagram -Anastasia is very active in this social media- that I received an invitation form Leo Sorribes. He told me that he had seen my video from Don Quixote and that he would be happy if I can join. I was very surprised as I thought that Instagram was to have fun and I was very surprised too because I was so young, only 22 years old, and this was the first invitation for such an important Gala and then when I knew I was going to share the stage with such amazing dancers as Lauren Curtbertson, Kimin Kim and so many famous and talented people I couldn't believe!! For my second time it was my premiere performing Diana and Acteon and it was a special moment for me. I have to thank vey much Xiomara Reyes and Larissa Lezhnina for their help and amazing coach. I was so lucky!! because I also had such an amazing coaches and a partner as Kimin Kim. Anastasia Limenko, Black Swan. Ibstage Galas. C.M. : Incredible it was your first time on it!! you both were amazing! And now I think that you are coming from Mexico because you have participated in a Gala there as well, isn't it ? A.L. : Yes! I was invited by Isaac Hernández. He is an amazing dancer and it was incredible because he gives something so special not only for audience but also for us the dancers. All the crew felt so happy and this was noticed on stage because everybody gave their best and one has to note that this was for a huge audience, 20.000 people, 10.000 each of the two performances and it has been really wonderful! I got to see also a work of a wonderful choreographer, Sebastian Kloborg, whose works I really like! C.M. : We noticed this amazing ambience between all of you on Instagram!! A.L. : Yeahhhh because it was a so warm atmosphere. We felt as if we were friends from many years, not just few days ago … wooww I still feel that energy on me! C.M. : And how were you involved in dance. When did you decide to become a ballerina ? A.L. : It is an interesting story because I never imagined that I would be a dancer. It was a dream from my mother. Before ten years old I never imagined that I would dance as I never had seen ballet. She brought me to a Ballet School and I started to love this art. I'm grateful to her and to my teachers who gave me this passion for this art that now is part of me. I started to take classes in a school in Bielorussia and moved to Moscou at fifteen. I was prize winner in the Moscou ballet competition and was invited at the Boshoi Ballet Academy and it was a huge change for me because to change Minsk which is really a cosy, quite and confident city to Moscou which is always crowded with people in a rush and so on, it was really difficult but of course I adapted and now after nine years I feel this city to be not my home but I feel confortable there. And now I really love dancing there because it is my way, what I chose for me to be my life. After graduation I was invited at the Bolshoi but I knew that I had to start at the Corps and maybe spend time there so I decided to join the Stanivlasky because I knew I would get much more opportunities to grow up and because I saw that I would be able to dance many roles quickly so yes this is my first company and I'm very happy, we have a really huge repertoire and I can work to be better and better with many opportunities. Anastasia Limenko, Black Swan Pdd with Igor Svirko. C.M. : And with the new Director Laurent Hilaire, did things change much? A.L. 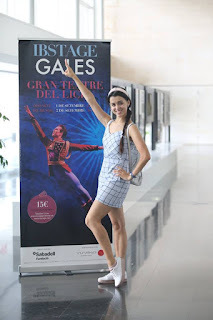 : Yes, yes, for me classical is the most important because it is the most dificult for our body and coordination so now I'm focussed to get more roles in classical ballet because I understand that I can do contemporary pieces a little bit later in my career. Of course I want to dance them and I really like to do contemporary pieces because you feel free with your body and you can just enjoy music and choreography but in classical you always have to be on square, feel your corps, be really clean in positions and it is the most demanding in our profession. C.M. : And in the Stanivlasky do you also have Cracko's, Mc Millan's, etc., in your repertoire ? C.M. : Maybe because of their dramatic side? A.L. : Yes, for me it is really important because I try to do my best with my technique only because this is our language and when you feel free with the language, then you can develop much better your dramatic part. When you do not need to focuss on your turns or in how much you lift your leg, this is a kind of freedom for you body. For me the most meanful thing is to bring stories on stage to share emotions with the audience. I think this is the most important in our profession than to show our techique. You can see incredible stuff in circus and gymnastic and sport and they will be better than us, but in the theater we can show emotions and you should understand the meaning of the ballet, what the choreographer wants to tell. For me it is my goal to involve more and more the audience to our art so that our art can really bright because we show people that world can also be beautiful when negative things happen. We try the world to be better with the beauty we bring. Of course our stories are about love, true love and happiness but there is also sadness, as it happens in life, and we have to accept that we can be sad but we turn sadness in a positive way, it is a different kind of sadness that can change you. You should accept that we can be sad but this can show you also how to be a better person. So yes this is the way I understand our art and for me this is the most beautiful work I can do. A.L. : Well, this is what I really think about our profession and I feel so happy with it! C.M. : Does the company tour? A.L. : Now not really. Because when our direction changed they decided that we should be more in Moscou. They wanted to change a lot our company and this is impossible if you are touring. But by my own I tour. When I started my vacation, that in fact I haven't had vacations, I began with a tour in South Korea, which also was an amazing experience, then I had these Galas in Mexico and now I'm here. This is a huge treasure for me because I meet wonderful people and each person you meet can be like a teacher for you, they can change your mind and this are experiences that reach you and make you to see other things, so I really like this. C.M. : And how do you feel here in Ibstage with all the students and sharing the stage with them ? A.L. : I feel really confortable because it is my third year. In September last year we arrived at the same time with Kimin Kim so we spent a lot of time together and many dancers came earlier too but this year I'm the first and I feel a little bit lonely but I really like Spain and I do love Barcelona and everybbody here at Ibstage does their best to make me feel comfortable and I really appreciate the opportunity to perform here beacuse it is also important for me to share my dance with many different people. I really want to wish Ibstage a good future and also to the company the Ballet de Catalunya. I understand that the situation is complicated now but I really wish them the best because they are all very nice and high professional people. This is such a really good thing for the ballet world these Ibstage courses and Galas and that a so brilliant new Company has born! C.M. : Have you seen the company rehearsing these days? A.L. : Yes I saw them rehearsing with Larissa Lezhnina and I know Rebecca Storani as we met already at the first Gala and we communicated really well, we are like friends and now it is really interesting because they are creating their own version of Don Quixote. And also it is fantastic beacuse they are inviting many people to work for the company because the possibility is really nice. I think they should be at the Theater of the Liceu and that they have more advertising in Catalunya because this is an amazing opportunity for the ballet and for Catalunya. I cross my fingers so that they can develop but I think all be ok because when there is passion on what one is doing then one can only succeed!! 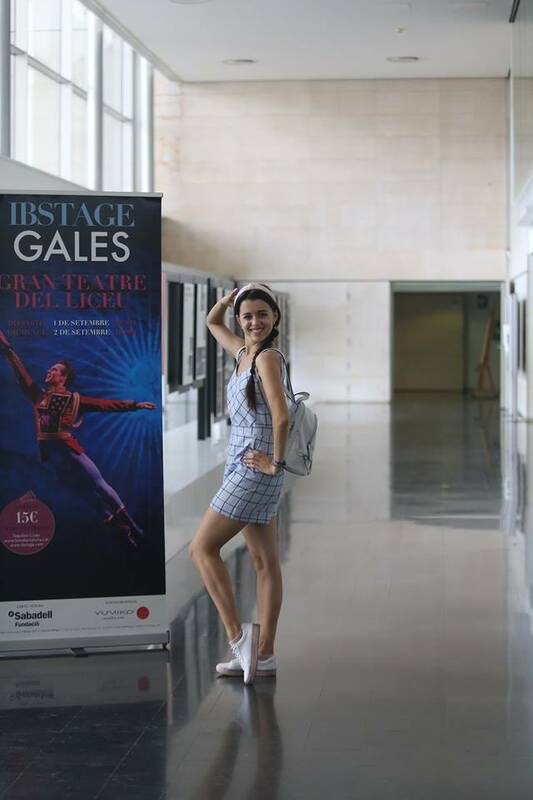 I also think that local companies have to be involved in promoting the culture and the art, they have to give funds so that this great reality that the Ballet de Catalunya is now, can continue its amazing work. C.M. : And for this year Gala what will you bring on stage ? A.L. : Well Igor will arrive on 1st september morning. It will be the premiere for him and for us together with Black Swan and we'll rehearse only the day of the fisrt gala in the morning. But no problem, for me it is ok because when I came the first time to Ibstage it was really difficult as I flew on the night and I had two performances the same day of my arrival and then I had to fly back to Moscou immediately. This has been the hardest stuff I have had to face and I survived and all went well so I'm sure I can afford anything!! And of course we already know each other because Bolshoi and Stanivlasky are very close in Moscou and we all communicate very often, so no problem for us. I hope the audience will enjoy the Galas, I'm very happy to have been invited again. Nice, friendly and very cute, Anastasia agrees to be photographed with all those who ask her or she spontaneously poses in front of the professional objective of Sila Avvakum, official photographer of the Mariinsky Theater of Sant Petesburg, who every year comes from Russia to cover Ibstage in Barcelona. The great teacher, very dear to all, Piotr Nardelli sees her and comes quickly to kiss her hand while she offers him a beautiful arabesque. Anastasia Limenko after the interview at the Institut del Teatre. Anastasia takes the opportunity to discover Barcelona these days, she walks a lot, from the center to the sea and to the sea to her hotel. Yesterday she walked five hours non stop. She says that these are the few days of vacations she will have but she loves so much her job and she is so passionate with what her life is that no matter. We knew the amazing dancer she is and now we have discovered the so warm and nice human being behind. Thank you very much and please come back soon Anastasia! The Catalan audience really loves you !! Catalunya Ballet in Fast Avance by Leo Sorribes. Ibstage starts this August with an outstanding event, such as celebrating its tenth edition this year. They have not been easy years since it started in Italy and even less, since its landing in Barcelona. Even so, it is indisputable to take a very positive look at everything that has been achieved especially from artistic, cultural and educational points of view. Ibstage is not just a more than realistic picture of what classical dance represents internationally speaking, with an exceptional program, as usual, destined for talents around the world and which offers a product of unique qualities that nobody else has achieved yet, but it is also the image of what it wants to be here, with the due recognition inside and outside, with an international and, at the same time, native concept that it intends Barcelona and Catalonia to be home of first rank dance productions and at the same time attracting the talent of everywhere, needed to make these creations come true. This young association is not only young, experienced and professional but with a great entrepreneurial spirit, risky and with the absolute capacity to break schemes year after year, despite conditions that are more than adverse and in times of great convulsions that not only affect them financially but that also drive them to question their own vision about the true lace here, where the capitalist and competitive mentality of our society and mistreatment of culture forces them to look for niches where nobody thought they could be, apart from encouraging the undoubted existence of a cultural audience, but that it must be nourished and well treated if you do not want to let it die, disenchant, or even worse conform. So, Ibstage has started for the sixth year in Barcelona with a history on its shoulders that sometimes many describe as an impossible feat. If something has Ibstage, is that it is not just a constant focus on landmarks that are almost unattainable here, but that it also follows its activity without the minimum conditions and structures allowing to ensure its subsistence which is always subject to results more that optimistics. It is taught at the Institut del Teatre from the 13th to the 30th of August, with the presence of great teachers of a renowned professional careers both in the educational and artistic fields worldwide. An artistic direction shared between the great maestro Elias Garcia, born in Sabadell, but with an international career that has led him to coach leading figures of dance, and Xiomara Reyes, the former ABT principal dancer and director of the Washington Ballet School. Among other great renowned figures, such as Rinat Imaev, Larissa Lezhnina, Piotr Nardelli, Yumiko Takeshima, Maria Luisa Arias, who are among many other masters and repetiteurs of the choreographies that will be presented at the final Gala. This year, the course has once again great support of such as that of the Institut del Teatre (Diputació de Barcelona), the Fund of Scholarships of the Banco Sabadell Foundation, which is still committed to the young talents who attend the course, the Generalitat de Catalunya and especially Yumiko, Official Sponsor and renowned international dancewear brand, together with collaborations with companies based in Catalonia that provide logistical support through an improvement in the services offered by Ibstage to its participants with very advantageous conditions. Without all of them Ibstage would not be possible, as well as its growing participation so necessary for the sustainability of the project. Why Ibstage: Ibstage was founded by Leo Sorribes and Elias Garcia in Italy and after 4 editions they moved to Barcelona. Ibstage's great goal has always been to consolidate classical and contemporary dance of quality in Catalonia, which after 6 years has given a first fruit full of hopes and that since very recently has started to create magnificent expectations in this regard. To retain the talent of our country, to capture figures and talent from all over the world, to import the best dance teaching techniques, to create own productions, to train dancers throughout all their career long, are some of the challenges planned to achieve. After 3 years preparing a really arid land, the founders of Ibstage have committed themselves in the creation of a company in Catalonia with which it is intended to give a totally different approach to the state classic company lacking the margin of maneuver so indispensable to achieve ambitious artistic milestones: The Ballet of Catalonia. Anastasia Limenko at the Ibstage 2017 Gala. For this, in this tenth edition, the Ibstage Galas will offer at the Gran Teatre del Liceu a triple artistic offer: Young talents from large national and international academies, showing some of the best choreographies in the repertoire presented in the last editions: La Bayadere, El Corsario, Paquita and Sleeping Beauty. Secondly first stars of the dance world will visit us as usual offering a repertoire selected especially for the occasion and with which we will enjoy great classical and contemporary choreographies of excellent interpretation. This year we highlight the presence of Polina Semionova, world star and currently principal dancer of ABT, and others, such as Anastasia Limenko, Miriam Ould-Braham, Semyon Chudin, Tatiana Melnik, the young Catalan dancer Martí Paixà (in the rows of the Stuttgart Ballet ), and until completing an almost overwhelming number of 12 guest dancers. 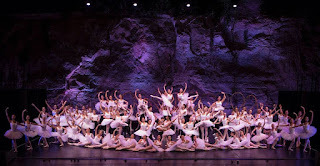 Ibstage stands out at educational level for its dual educational aspect of both the dance audience and the begginer one. Ibstage is basically defined as a technical-artistic improvement course aimed at students who are training in the profession of dancer, offering a top-level teaching team from prestigious schools and companies. Ibstage in addition, during the 3 weeks of the course, opens its doors to the general public, attracting dance professionals from any field, students, but also people who feel inquisitiveness about a discipline that often conceals erroneous conceptions or prejudices towards its reality, bringing common people closer is an enriching experience that allows them to convey their values ​​and knowledge of cause, as well as to foster the critical spirit of the audience. The press and media are invited to the Institut del Teatre from the 13th to the 30th of August to attend classes, rehearsals, from 10:00 a.m. to 5:00 p.m. It has to be outlined that the Ballet de Catalunya will be present throughout this period. The General Director, Artistic Directors, teachers, dancers and participating students could be interviewed. From 31st August to 2th September, dancers and students will be at the Gran Teatre del Liceu. The performances of the Galas will be the day 1 at 8:30 pm and day 2 at 6:00 pm. Press Conference will be convened with the presence of the international guests invited on August 31 and Graphics ?? (leo) During the period from July 16 to August 10, interviews with the Directors (Ibstage and Ballet de Catalunya): press, radio and television, locally, autonomously and nationally. 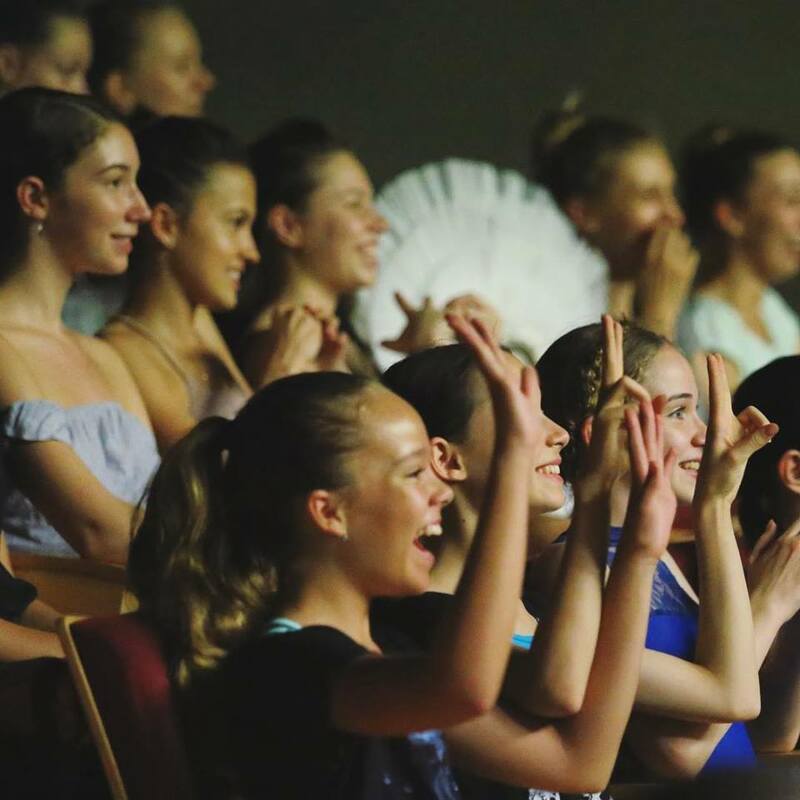 Others: Days 30 and 31 of July there are Auditions for the Ballet de Catalunya at the Cultural Terrassa Center with the presence of candidates from all over the world. Next premiere of the Ballet de Catalunya: EL QUIXOT, November 10th. The «Ballet de Catalunya» is already underway and after what was seen in the Presentation Gala of the company, we can only hope that this magnificent project is consolidated. They deserve this and we need them. "For three years, they have been sowing the seeds, designing a custom-made project for Catalonia with international projection to be enjoyed by our esteemed audience. The project was based out of concerns and sensibilities of people and institutions who were searching for a way to bring the best dance here, giving Catalonia the image it deserves. Throughout difficult yet enthusiastic years, people from all over have come together with the original promoters from day one in order to arrive where we find ourselves today. Not only will we see 19 incredibly talented dancers but a great amount of courage on display. Effort and enthusiasm can only begin to describe what these dancers bring to the performance. Let them express how they feel through the best way they know, because words would never be enough to express what they want to say. The presence of all who are here today is immeasurable and we would like to thank each and everyone of you. And above all, we express our gratitude to the city of Terrassa for welcoming the Catalunya Ballet. Thanks to all who have come from near and afar. We hope you feel at home and we will continue to come back in the immediate future"
This was how the Ballet de Catalunya presented itself to the audience that filled the Terrassa auditorium on the afternoon of November 19, the day of its presentation. The dancers of the Ballet de Catalunya (BNC) have been selected from a total of 200 candidates and are in Terrassa betting on this project aware of the difficulties, but delighted with the experience and the prominence that gives them being the first dancers of the BNC. 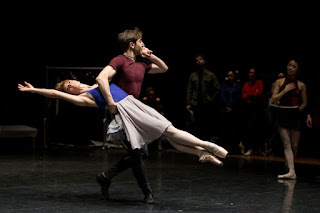 Mathilde Marlin & Lorenzo Misouri in Corpo. And for the ballet public, who came quickly to discover them, it is a dream to have our company, to become familiar with them, to follow their evolution, enjoying some more in a certain style, others in another. Surprising ourselves when discovering qualities that we had not detected, respecting them, admiring them, even loving them as close beings, so necessary in our lives. Artists that bring us peace, emotion and joy in times when we need all this so much. In short, living it intensely, much more than any ballet lover from another country, given that we have been denied to have this for so long. Exciting to discover among the public, teachers, former directors of companies, choreographers of the country who, generous, support the project and tend ties, as it should be. Feeling that on the other hand this is reciprocal, since from the management team of the Ballet of Catalonia the company is open to anyone interested in contributing and collaborating. Mrs. Mercedes Ribera, who at 103 years old is a tireless follower of Ibstage, could not miss this inauguration Gala, as we also discovered admired the ex-étoile of the Paris Opera Ballet, Hélène Trailine with whom the dancer Elías García, Artistic Director and teacher of the BNC, took some ballet classes while dancing with the Ballets of Montecarlo. It's a project that really thrills, the more you know it more and the more you know its dancers more and the more you see them working in class, rehearsing and now in this first show, even more. A consolidated team, with Leo Sorribes at the front, Elías García and Larissa Lezhnina, she to a lesser extent, in the artistic part, Marina Quera in the administrative and financial part, Gina Nunura and Martina Montorfani, in costumes and the teachers, apart from Elías himself, Ángeles Lacalle, Gloria Gella and Ksenia Korobchanskaya, who also acts as a repetetor, polishing, improving, taking care of style details, as well as Ricardo Alegría as technical manager and lighting design. The Cultural Center of Terrassa, which celebrates its 35 years of dance season, being a reference in this art throughout the Spanish state, is hosting its headquarters. So the Company could not be presented any were that there. The Opening Gala showed a very young cast, dancers from Japan, Italy, Russia, Ukraine, Portugal, France, Germany, Spain and, of course, including three young Catalans. 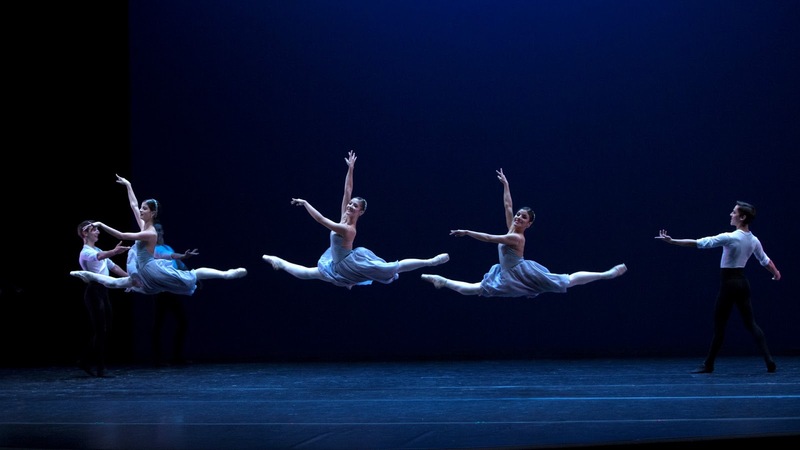 They staged a varied program that in its first part showed fragments of classical ballet, neoclassical and more contemporary styles, to demonstrate the repertoire to which the company aspires. The second part was devoted to the demanding work of the classical repertoire, Paquita, which was offered to us in the form of a suite for showcasing the soloist and principal dancers of the cast together with the dance corps. 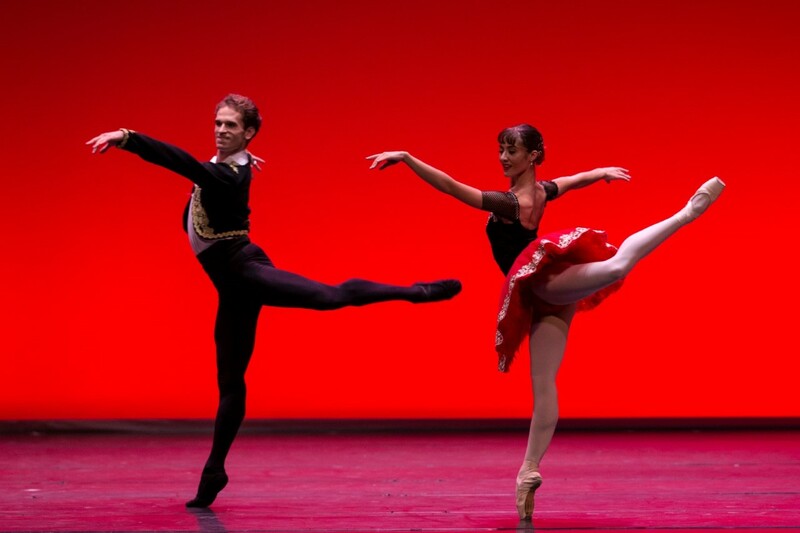 Miho Okamura, Alessandro Burini & Alexandra Urcía in Paquita P. de Trois. What we saw at the Gala were enthusiastic, excited and happy young people, full of talent and with great potential, who defended a program worked in just three weeks, in an admirable way. They can get much more, of course, as it is clear that they will achieve it. Maria Luisa Yoshida in Paquita. The first part began with a very beautiful choreography by Elías García, Ensemble, with music by Mozart, in which we were able to enjoy a large part of the cast and to discover the work of some soloists. It followed a Pas de deux of The Corsaire, well danced by María Luisa Castillo Yoshida and Leander Rebholz. The variation of the three odalisques of the same Corsaire, with Madoka Sasaki, Rebecca Storanni and Valeria Kuts was very celebrated, the three were great, each in its variation, the nerves were disappearing and the program was developing in an "in crescendo" that the public was enjoying more and more. The most contemporary part of the Gala was the Pas de deux Plenitudo (2002) of Italian choreographer Raphael Bianco, danced by Júlia Roca and Lorenzo Misuri. Júlia, a former dancer of Ángel Corella's Barcelona Ballet and the Companhia de Bailado of Portugal, has decided to return home. What a pleasure to have her between us again. Júlia has always been a classical, elegant dancer with a strong stage presence, which did not prevent her from perfectly integrating this contemporary piece into her repertoire. Lorenzo, on the other hand, was revealed as an important asset of the Ballet de Catalunya, a very expressive and confident dancer who that day celebrated its twentieth anniversary. 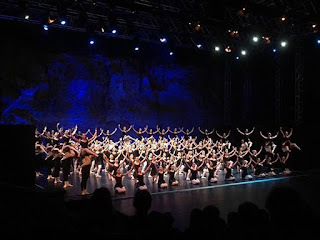 The first part was closed with Corpi (2001), another creation of Raphael Bianco, with music by Rachmaninov, in which the dance corps and soloists participated. The bodies of the dancers in flesh colored maillots are shown in all their splendor, creating figures of great beauty. A work in line of that of creators such as Kylian or Wheeldon, which subjugates and transcends. The dancers were fantastic, Mathilde Marlín, already discovered in Ensemble, is wonderful here. She is the prototype of a ballerina, with stylized lines, a sweetness of movement and a beautiful expression, no matter what the style of the choreography is. In the second part, with Paquita's suite it was where the best potential could be discovered. This demanding work of classical ballet did not disappoint. The dancers have style and despite not being a uniform cast, its directors have been able to place each one where it looks better. So, for example, the fantastic dancer, well known to us, Alexandra Urcía, 18 years old and who together with Júlia Roca and Mónica Gómez are the three Catalans in the cast, formed a trio with another small dancer of stature but also plenty of talent, Miho Okamura, 19 years, and both, with the magnificent Alessandro Burini, danced a Pas de trois loved by the audience. Monica, on the other hand, has just finished her training at the Corella Dance Academy and she told us how happy she was to have her first contract as a professional dancer in her own country. Having seen her very often in the year end festivals of the academy, where she always had roles of principal in whose she was always great, we are very happy for her and for us being able to follow her evolution closely. The Paquitas, that of the beautiful María Luisa Yoshida, so exquisite in its variation and that of the spectacular Rebecca Storani, already well known and admired by the Catalan public, because of the Ibstage program and Galas and indisputable star of the company, with her spectacular pirouettes and fouetées. The two Lucien d'Hervilly's, Leander Rebholz and Lorenzo Misuri are surely other two values ​​of the cast. Several variations and the beautiful corps, completed a suite that allowed us to dream of a company that will give us great joys. Thank you very much dancers, all of you, for a very good performance that we enjoyed with great excitement. This company has to consolidate itself as our ballet company. This time, yes, please. Several ways of collaboration have been established so that it not only depends on public support. Now, despite the great interest shown by the Conseller of Culture, Lluis Puig and his entire department, is not yet signed, given the special circumstances of the Govern of Catalonia. Private sponsorship is sought. As in many European cities, the main companies finance the dance companies for identifying themselves with the ​intrinsic values to the art of ballet. We hope that they can find here brands that recognize and want to take advantage of the prestige that would suppose for them to have such a powerful image. 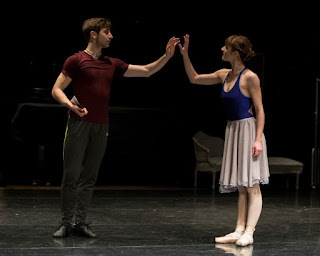 Madoka Sasaki & Lucien Vecchierelli in Corpi. Beauty, quality, perfection, or the closest to it, can only be achieved through effort. Porsche for example, sponsors the Stuttgart Ballet. The image of Alicia Amatriain, light, subtle, aerial, ethereal, but at the same time strong, secure with steel tips nailed to the ground in an impossible balance, is extremely convincing and transmits in an unequivocal way the values ​associated with a high level dancer: Perseverance, tenacity, physical and psychic strength, discipline, ambition, effort, capacity for suffering and overcoming, tolerance, teamwork, ... Values that any brand would surely be proud to transmit, without forgetting the plastic beauty of a good dance image. The Ballet de Catalunya is a private institution promoted by the Foundation of the same name. The great challenge of the Foundation is to position Catalonia as a national and international point of reference for the creation, awareness and diffusion of the art of dance. At the same time it is presented as an accessible institution to all those who want to enjoy the dance whatever their nature (public or private). 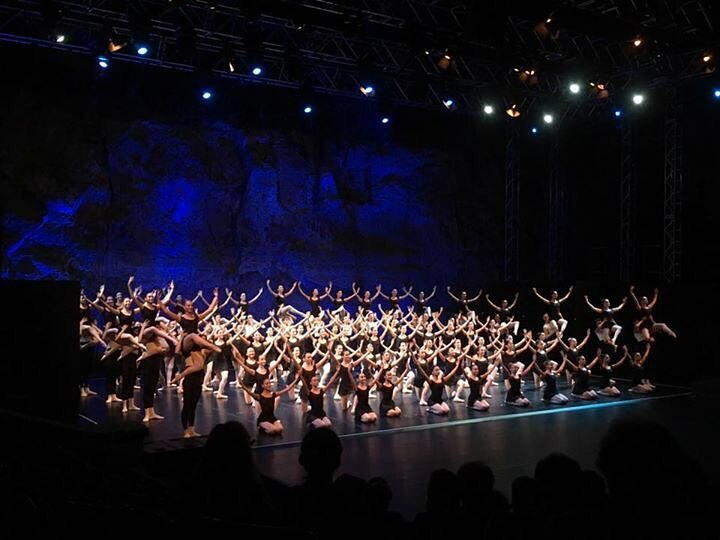 The Ballet de Catalunya seeks to be present in the best theaters, but also wants to reach the public by offering services adapted to different formats and proposals of all those who want to incorporate dance into their celebrations, events, institutional events, popular festivals and a long etcetera. They offer interesting tailored proposals, depending on the number of dancers, time and number of performances, with different formats and stagings. Tailor-made shows are designed according to the needs and desires of the client who has the possibility to visit the company and choose the dancers, if interested please visit here. Likewise, the Ballet of Catalonia is in search of funding and funds from patronage and sponsorship. They offer diverse formulas adapted to any type of proposal, either with contributions to the activity (productions), sponsorship of dancers and Trainnee students and financing or contributions to face the investment of the Headquarters of the BNC. For our part, we are eagerly awaiting the Nutcracker, which will premiere on January 4 at the Kursaal Theater in Manresa and for which there is already more than half capacity sold. Tickets here. Angel Corella, "I've mortgaged to the teeth"
"Multiplicity, Forms of Silence and emptiness"